Waterstones is buying the 115 year-old family-owned chain Foyles, saying the deal will help to "champion" real bookshops in the face of online rivals.The sale includes Foyles' well-known Charing Cross Road store in central London, which was relocated to larger premises in 2014. Waterstones said the deal would help booksellers fight back against Amazon's "siren call".The larger chain has 283 bookshops across the UK and northern Europe.Foyles was founded at the turn of the last century by the Foyle family and for more than half a century was run by the famously eccentric Christina Foyle. Her approach included sorting the books by publisher rather than alphabetically, and regularly dismissing staff after a year. Her nephew, Christopher Foyle, who took over the company from her, welcomed the deal as one that would protect the Foyles brand and personality as it entered a new chapter. "I look forward to witnessing the exciting times ahead for the company founded by my grandfather and his brother 115 years ago," he said. 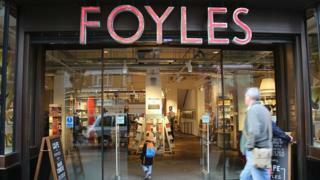 Foyles has struggled to remain profitable as online booksellers have battered traditional stores. Why is Foyles' Charing Cross Road shop famousPerversely, it was partly because the shop was so badly run that it seemed to charm its customers.Books were filed with total disregard to logic, and modern technology including automated tills and computers was stubbornly resisted. Customers were obliged to queue three times to purchase a book.But as Agatha Christie wrote in The Clocks, it was as if the books "had run wild and taken possession of their habitat". Waterstones was bought by activist investment fund Elliot Advisors earlier this year, but the new owners retained James Daunt as chief executive. The chain returned to profit under his watch in 2016, and he said the investment by Elliot would lead to more new store openings because the economic downturn had made empty space available in desirable locations.Mr Daunt said the acquisition of Foyles would leave the company "stronger and better positioned to protect and champion the pleasures of real bookshops in the face of Amazon's siren call".He said good bookshops were rediscovering their purpose "in the fight-back against online and e-reading".The transaction - the terms of which were not disclosed - is expected to be completed before the end of the year.